Inherited retinal dystrophies encompass a broad group of genetic disorders affecting visual functions in as high as 1 in 3,000 individuals around the world. Common symptoms include loss of central, periphery, or night visions, and in severe cases progression to complete blindness. Syndromic forms also exist involving abnormalities in other parts of the body. Currently, more than 250 genes representing a wide variety of functional roles have been shown to be responsible for the disease phenotypes. Moreover, mutations in the same gene sometimes cause different phenotypes while mutations in multiple genes can give rise to the same clinical subtype, further demonstrating the level of complexity in these disorders. Such genetic heterogeneity has substantially complicated the process of pinpointing precise genetic causes underlying these conditions. 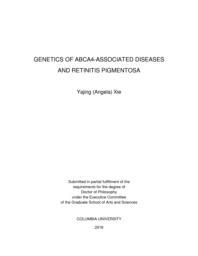 The goal of my thesis research is to clarify the genetic causes underlying retinal dystrophies, with a primary focus on phenotypes resembling ABCA4-associated diseases and retinitis pigmentosa in both syndromic and non-syndromic forms. Recent advances in the next-generation sequencing (NGS), the high-throughput, ‘deep’ sequencing technology, have enabled several novel genes to be identified, or found new mutations in known genes. Nevertheless, a substantial fraction of unsolved cases still remain. The primary work in this thesis involves utilizing NGS, particularly whole-exome sequencing, to identify disease-causal mutations in families where at least one parent and affected or unaffected siblings are available. Determining all genetic variation underlying retinal diseases is necessary for precise molecular genetic diagnosis and improved prognosis of these conditions. The first part of my thesis highlights the complexity in genetic inheritance of diseases caused by mutations in the ABCA4 gene. In a substantial fraction of Stargardt Disease cases with only one mutation in the ABCA4 coding region, deep sequencing of the entire locus identified the second mutation in the intronic region of the gene in 10% of cases. The genetic heterogeneity of ABCA4 was further demonstrated by the identification of 4 different pathogenic ABCA4 mutations and 4 phenotypes in a single family. These findings epitomized the extremely complex mutational spectrum underlying the ABCA4-associated diseases and suggested thorough sequencing of variations in the entire genomic locus, including copy number variant analysis. In the second part of my thesis, exome-sequencing has led to findings of phenotypic expansions in known disease gene, and in one case the precise molecular diagnosis resulted in an immediate treatment. A family with 2 affected siblings presented novel phenotype of a macular dystrophy caused by mutations in CRB1. In another family where 9 members were affected with late-onset BEM, a mutation was found in CRX given incomplete penetrance. In one family with an affected adult, two well-documented mutations in MMACHC - a gene causal for a potentially debilitating disorder of cobalamin deficiency, were found to segregate with bull’s eye maculopathy (BEM) and minimal systemic features in the proband. Early diagnosis in this patient resulted in hydroxycobalamin treatment for her condition, and possibly an improvement of her systemic prognosis. Together, these findings revealed that clinical phenotype can be very divergent from those described, and only genetic testing can unequivocally determine the cause of a disease. The third part of my thesis work highlights first-time discovery, and co-discovery of new genes associated with retinal diseases. A new form of syndromic RP was investigated in a family presenting a previously undescribed constellation of phenotypic features. Exome sequencing analysis of 3 affected siblings and their unaffected parents revealed deleterious mutations in the RDH11 gene. In another family where 2 affected siblings presented with a remarkably similar phenotype, no mutations in RDH11 were detected. However, analysis of absence of heterozygosity revealed causal mutations in the CWC27 gene. In the search for novel genes in cone-rod dystrophy cases negative of ABCA4 mutations, WES identified new rare, deleterious mutations in RAB28 in two families of Spanish descent. These findings revealed novel genetic causes underlying hereditary retinal diseases, and demonstrated the effectiveness of WES analysis in rare disease gene discovery. In summary, this work represents a comprehensive mutational analysis of inherited retinal dystrophies with complex genotype and phenotype correlations, utilizing next-generation DNA sequencing in large study cohorts. The power of whole-exome sequencing for gene discovery was well demonstrated by unequivocally solving close to 50% of all patients examined in this study. Establishing precise correlations between genotype and clinical phenotype is important for facilitating patient care, counseling, and therapeutic intervention for inherited diseases.